In the early 1900s, Fairbanks newspapers often carried stories about the arrests and trials of those accused of being mentally ill. 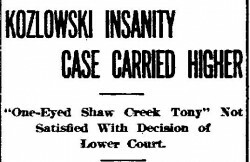 I recently came across the story of Anton (One-Eyed Shaw Creek Tony) Kozlowski. A series of stories covered his trial and appeal of the jury’s guilty verdict. After the appeal, he was kept in jail to see if his condition would improve. He was eventually admitted to Morningside on October 22, 1911 and discharged a year later. 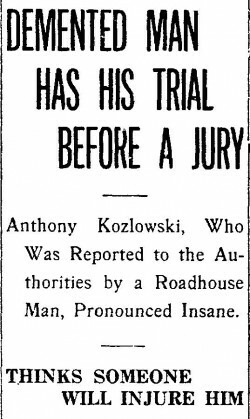 August 8, 1911: The Fairbanks Daily Times reported that a six man jury determined that Anthony Koslowski was insane. The newspaper reported that, “He declared that he was being pursued by men intent upon taking his life, and even now is under the impression that there is some one in town intent upon killing him for reasons that he refuses to divulge.” The six man jury deliberated for a short time and delivered the following verdict: "We, the Jury, Impaneled and sworn to Inquire into the sanity of Anthony Kozlowski do find that he is Insane and that he ought to be committed to the sanatorium provided for the insane of the territory of Alaska. Dated at Fairbanks, Alaska. 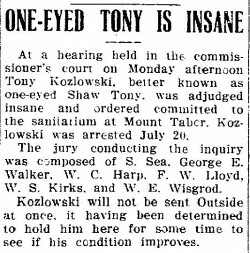 August 7, 1911.” August 8, 1911: The Fairbanks Daily Times noted that Kozlowski decided to appeal the jury's decision: "Anthony Koztowski, better known as "One-Eyed Shaw Creek Tony," who was adjudged insane recently by a jury in the commissioner's court, has decided to carry the case to the district court." August 14, 1911: The Alaska Citizen reported, "Kozlowski will not be sent Outside at once, it having been determined to hold him here for some time to see if his condition improves." This entry was posted in 1900-1929, Patient Stories. Bookmark the permalink. Post a comment or leave a trackback: Trackback URL.